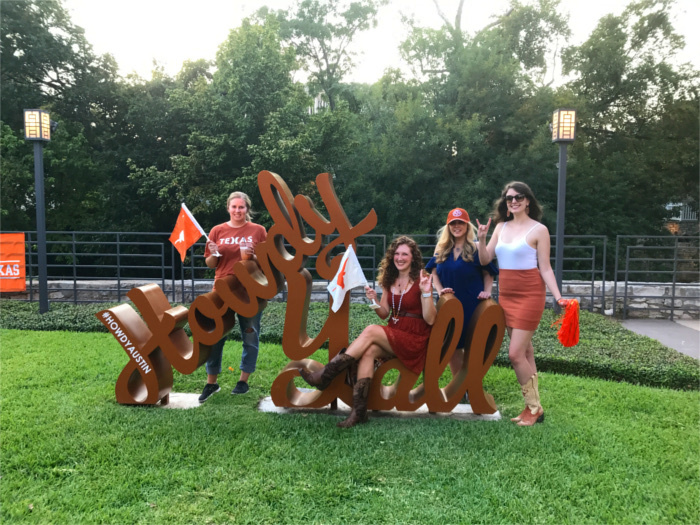 So, if you are new to Texas football culture or want insider tips on how to tailgate like a local in Austin, then here’s an expert guide. Before anything else, you need to gear up. The only thing more important than football in Austin is what you’re wearing to watch it. Gone are the days of throwing on your favorite team’s t-shirt and a pair of jeans. Austinites are sophisticated when it comes to sporting team colors, and several shops around town are known for providing chic game day attire. Think dresses, tops, shorts, hats, and even dapper ties and button-downs in, you guessed it, burnt orange. Whatever your heart desires in burnt orange can be found at University Co-op, located on the Drag across from campus. The Co-op was founded in 1896 by Professor William J. Battle and has been serving the students of The University of Texas at Austin ever since. Need UT-themed school supplies? A dog bowl with the UT logo? Hip garb for men or women to don at this Saturday’s game? Then head to this burnt orange mecca for a plethora of options. In 2010, Tessie Williams founded Longhorn Fashions to solve her tricky search to find burnt orange clothes. 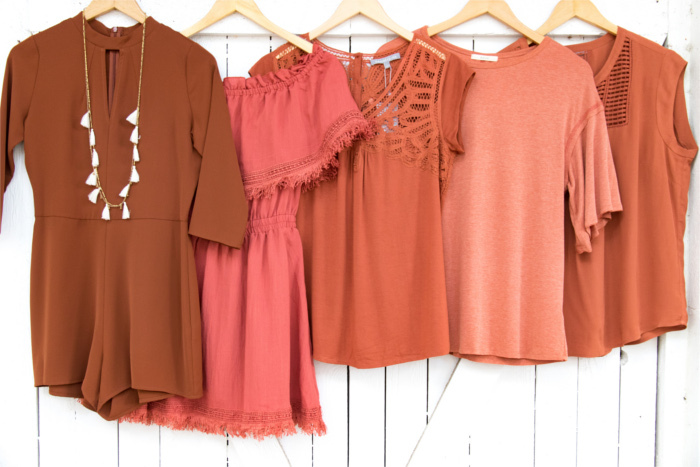 The boutique was founded on the credo that “wearing your school colors can be done in style without breaking the bank.” It offers students and young professionals a variety of burnt orange options. Adelante means “forward” in Spanish. But when it comes to this boutique, I’m pretty sure it stands for “fashion forward.” Although originally founded in San Antonio, this stylish fashion house has been in Austin for 25 years. Stop in to shop their sunset-palate apparel. Now that you’re dressed, it’s time to figure out where you and your crew will be tailgating. 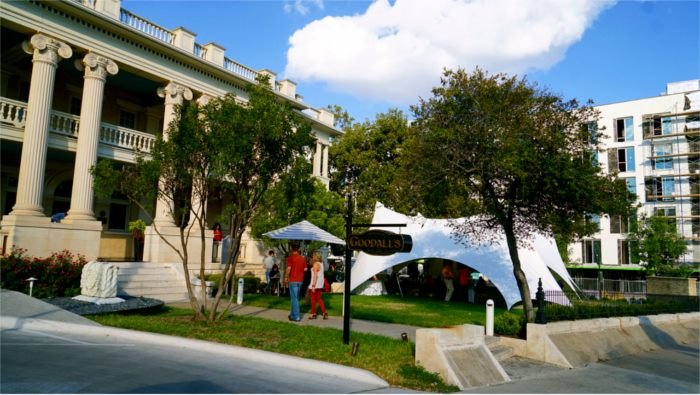 If catered food and open bars in swanky settings are what you crave, then tailgate in style at the following Austin venues. Downtown behind the Sheraton, there’s a grassy lawn that transforms into ground zero for UT tailgating on Saturdays. 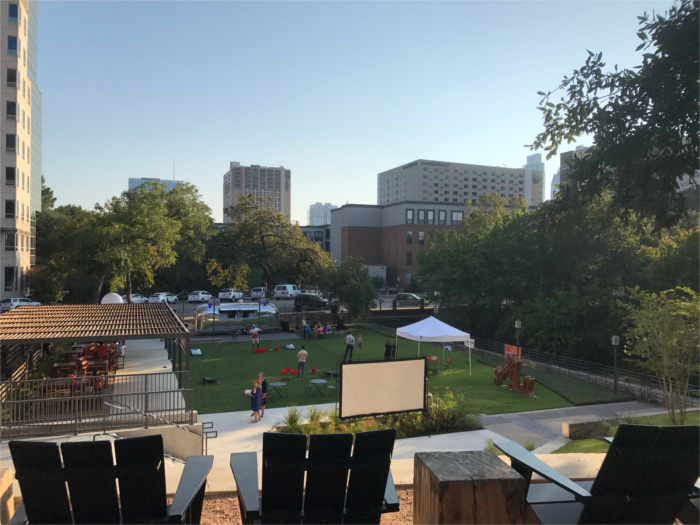 Sprawl out on the beautiful greenery, enjoy eats and drinks from a food truck, and watch the game on the big projector with the Texas Exes Austin Chapter. It’s a marvelous and family-friendly way to show Bevo and team your support. If sweating in the campus parking lot with 97,000 other die-hard fans doesn’t interest you, then why not elevate your tailgating experience at Hotel Ella? This boutique hotel’s annual tailgating event has “fancy” in the name, so it’s guaranteed to suit upscale tastes. Guests are invited to enjoy a game day buffet from Goodall’s Kitchen and specialty cocktails, beer, and wine while watching the pre-game broadcast and live game. What better place to flaunt your UT pride and grab a bite than at a restaurant named after Longhorn quarterback and 2006 Rose Bowl MVP, Vince Young? Enjoy a satisfying meal from this chophouse before, after, or during the game. And be sure to wash it down with a UT-themed cocktail. 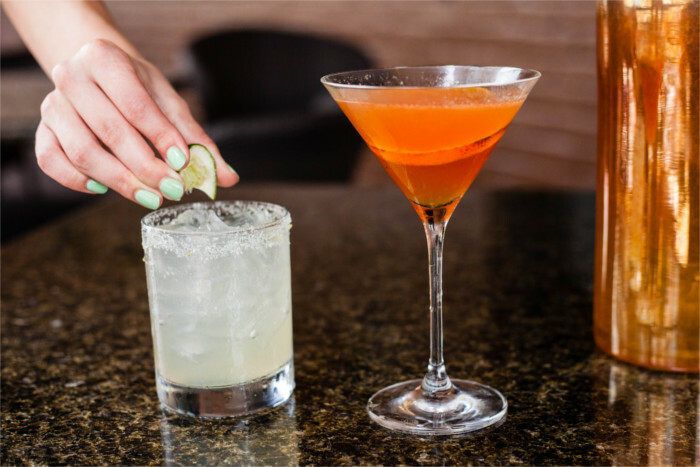 Choose between the Burnt Orange-Tini, featuring vodka, pomegranate liqueur, and orange juice, or sip the inVINCEable, made with Patron Silver, Patron Citronge, agave, and fresh lime. 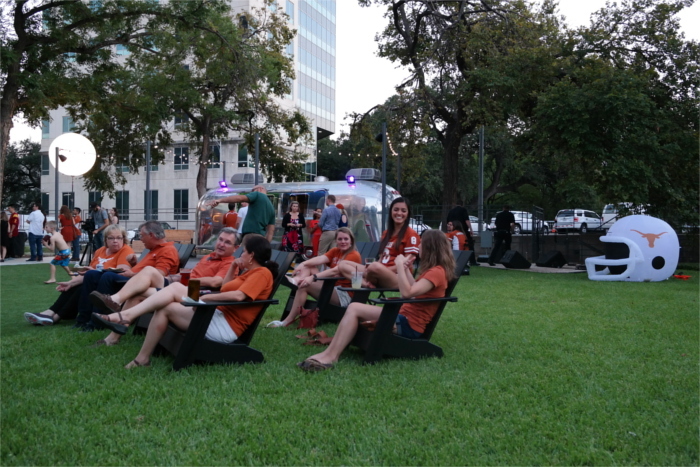 For a more local vibe, cheer on the Texas Longhorns with local fans, alumni, and students through these official University of Texas tailgating organizations. 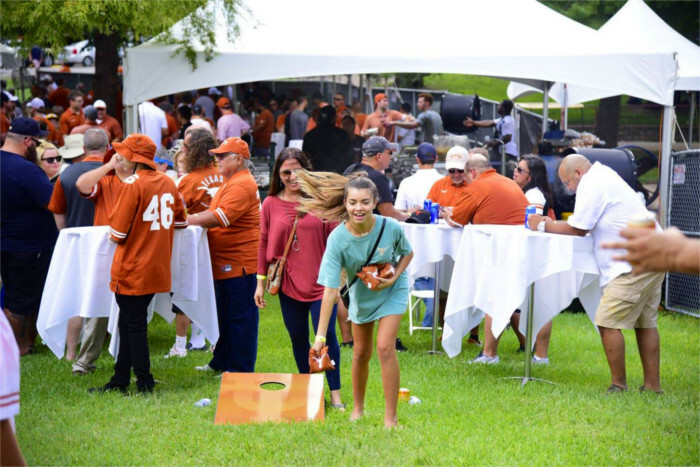 Head to the Etter-Harbin Alumni Center this season to attend the largest tailgate in Texas. The Alumni Center hosts an average of 10,000 attendees for each home game, making it a top choice for anyone wanting to get an authentic tailgating experience. Festivities begin three hours before kickoff. Guests can enjoy food and drinks from a cash bar, then watch the game on an inflatable screen outside (weather permitting). Admission for Members is free with proof of membership and $10 for non-members. Members of the UT Club and their guests can spend Saturdays cheering on the ‘Horns at The UT Club and Tailgating Tent. The 6th floor of the club features a full bar and Texas-sized buffet, with multiple TVs streaming the game at once. Members and their guests can also tailgate at The UT Club Tailgating Tent, located on 23rd Street across from the North End Zone main entrance of the stadium. Enjoy live music, a full bar, and Black’s Barbeque before and during the game. For membership information, contact Membership Director Rachel Fletcher. The Legends Club offers free game day perks to members, including a prime location on the first floor of the Etter-Harbin Alumni Center, complimentary buffet and soft drinks, and six flat screens for your game-viewing pleasure. Members and guests can access the club three hours before kickoff to tailgate in style. Don’t feel like going out to watch the game? Then gather your friends and host a tailgating party at home. It’s easy with natural and organic fare from Wheatsville Co-op. This local grocer has been serving Austinites since 1976. 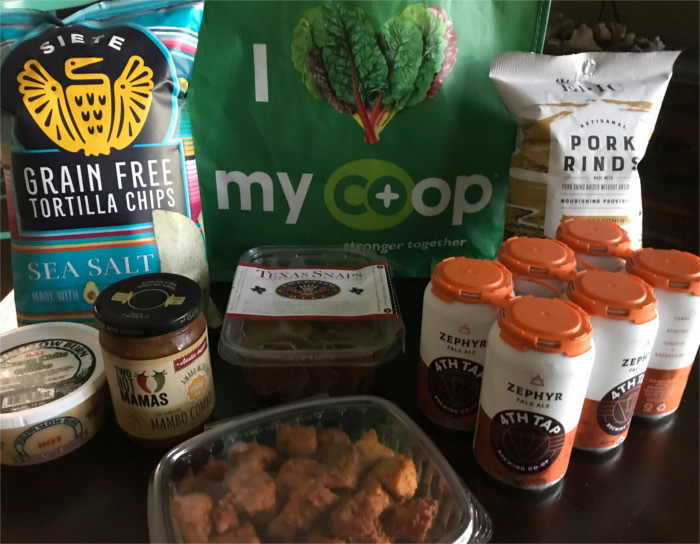 Some of its best local, tailgate-friendly items include the original buffalo popcorn tofu with vegan Blue Cheez dressing, Siete Grain Free Tortilla Chips, Austin Slow Burn Queso, Two Hot Mama’s Salsa, 4th Tap Pale Ale beer, and Sweetish Hill Texas Snaps. These game day provisions are sure to keep you going until the last quarter. Whether you’re celebrating out and about, or keeping it close to home, the best way to tailgate like a local is by letting your UT pride shine as bright as The UT Tower on a Saturday night after a victorious win. Where’s your favorite place to tailgate like a local in Austin? Disclosure: Wheatsville Co-op covered the cost of my tailgate kit for the purposes of this review. All opinions are my own.